﻿ A touching Report on Balaji darshan for 1000 differently abled children organised by Friends of Tribal Society. A touching Report on Balaji darshan for 1000 differently abled children organised by Friends of Tribal Society. It was 11th December 2013, a Thursday morning 4.30AM and normally a quite platform number 11 of the Chennai Central railway station was buzz with activity of a peculiar type. At one end there was decorated stand with banners while the other end a group of young volunteers were receiving children of different kind. While at other places lots of packets were getting unloaded. In the center more than 1000 children were sitting quietly in the platform along with their guides. The train arrived at 5AM. It was a train with a difference. There were special stickers put up and some volunteers were affixing some more. On getting the clearance from them the children started moving to the compartments as they knew in advance where they have to go. And here was a great surprise. 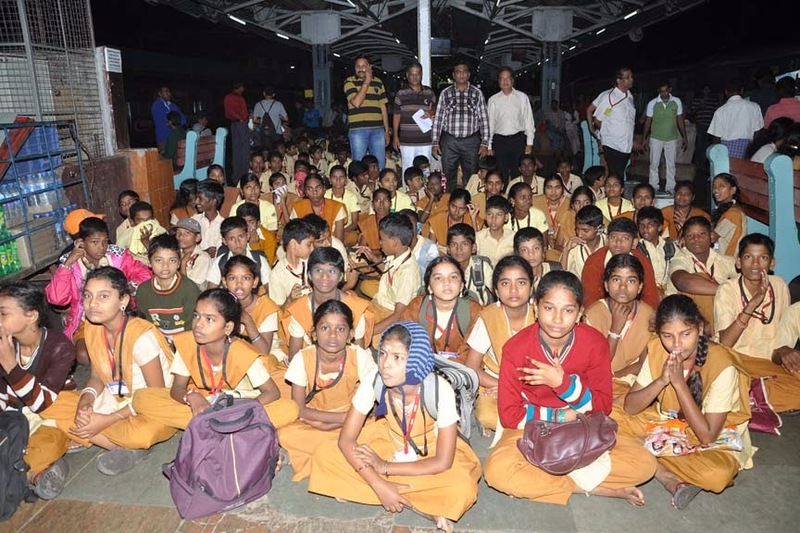 These were blind, deaf and dumb, physically challenged and small children from Chennai, Salem, Namakkal, Cuddalore, Tirunelveli, Ramanathapuram and had come for the special darshan of Lord Balaji by a special chartered train organized by Friends of Tribals Society (FTS) Chennai. FTS Chennai had involved local organizations like RAJAT, RYA Metro and RYA Metrostar to execute the logistics of safe handling of this mammoth activity. At 5.30AM sharp the social welfare and mid day nutritious meals minister of Government of Tamilnadu Smt Valarmati arrived and was pleasantly surprised to see the magnitude of the arrangement. She met the children, organizers and wished them success. She also flagged off the train along with Sri krishnan, GM, IOB at 6AM. 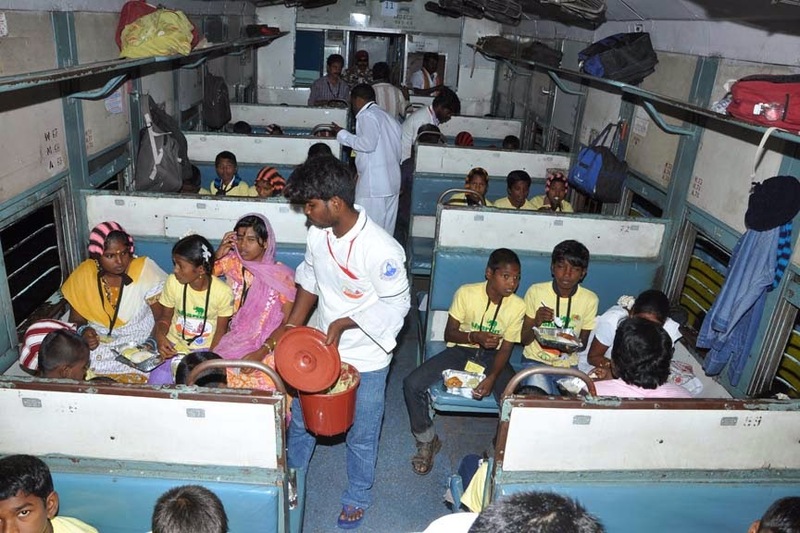 After the train moved from the platform, the compartment coordinators took over the charge to take care of the children and ensured everyone got a proper seat, breakfast, water bottles, snacks and biscuits. In some compartments Antakshari was going on. In some tattoo or mehendi or astrologers were interacting with children. The media students of MOP Vaishanv college for women, Chennai were interacting with children and taking their photographs and interviews. At 10.15AM the train reached Renungunta railway station where volunteers were waiting to receive them with 35 buses to carry them to Tirumala. As every child has been briefed which bus to board the group shifted smoothly to buses and reached Tirumala at around 11.45AM. After assembling at Tirumala all proceeded for Annaprasadam and assembled near main gate of the temple where special permission was accorded to the group for Darshan of Lord Balaji. The whole Tirupati Temple was filled with children wearing YELLOW SHIRTS AND VOLUNTEERS WEARING WHITE Tshirts and having an exclusive Darshan of Lord and received HIS blessings. After the Darshan while a group was busy arranging Laddus the other was arranging the boarding buses for return journey. The buses started for their return journey to Renungunta where the chartered train was waiting for the journey back home. The group sat in their allotted places, took freshly cooked food, shared experiences and received the return gifts during the return journey. The train reached Chennai around 11.30PM with all safe and all blessed. Many of the group went home the same day, around 200 stayed back and went to their destination the next day. The arrangement for their night stay was also organized for this purpose. This whole exercise was done as a part of public awareness activity relating to the silver jubilee celebrations of FTS. This unique activity was the brainchild of the Project Coordinator Sri Ravikant Choudhry. This not only resulted in awareness of the FTS and its activities during this silver jubilee year but also generated funds to run nearly 400 EKAL Vidyalayas! On 15th of December the Sunday, a thanks giving program â€œMiracle on wheelsâ€ was organized to thank the sponsors, volunteers and donors of FTS Chennai by showing the famous program of Ability Unlimited, Delhi on wheel chairs. Very touching . May the God bless all the children as well as the organisers / volunteers.